Chile Colorado – this rich and hearty stew recipe is lip-smacking good! Beef stew meat simmered in a Mexican style red chile sauce until fall-apart tender. Chile Colorado is delicious served by itself, with tortillas or rice and perfect for making shredded beef tacos and beef burritos! I am providing instructions so you can make this tasty Chile Colorado on the stove top, in the oven or in the slow cooker! This easy beef stew recipe starts with whole dried chiles, tomato and spices that are blended into a flavor-packed red chile sauce. Yes, this Chile Colorado is the real deal! No canned sauce here! But, don’t let that stop you or intimidate you. I have a few shortcuts and simple instructions that will make this delicious Authentic Mexican dish a breeze to make! My oldest son and I used to go to a Mexican restaurant in Moorpark, California that in our opinion makes the best Chile Colorado! The beef stew meat was melt in your mouth tender, incredibly tasty and the sauce was thick and full of flavor! Not really spicy but bold like a good homemade chili. Since moving out of state, we’ve been looking for a way to recreate the experience. After trying different Mexican restaurants, we decided it was time to make this (and other) Mexican dishes at home. After a few trials and some errors we think this is the best beef stew! 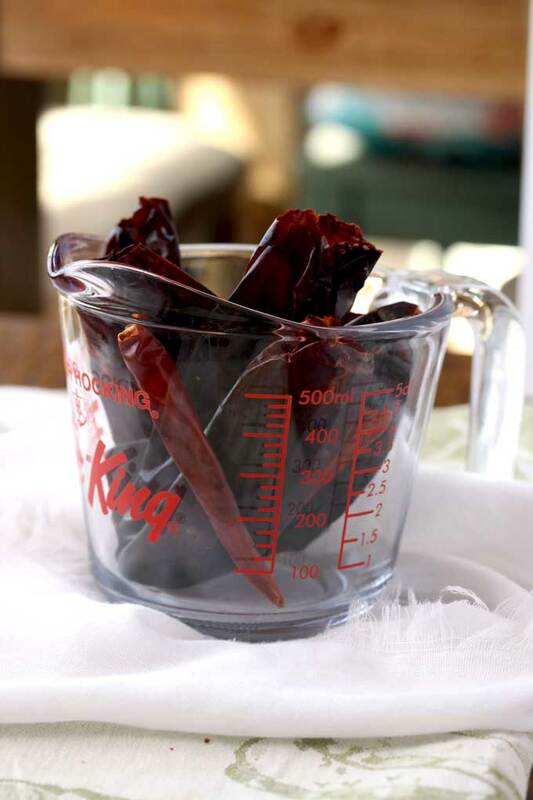 Dried Chiles: You can use a combination of dried chiles (see recipe below) or simply use one or two types of chiles. If using only one type, I suggest using New Mexico chiles or Dried Ancho Chiles (not in the recipe but it makes a great sauce!). Dried chiles are found in bags either in the Ethnic or spice isle of most supermarkets. Broth: I prefer using chicken broth. 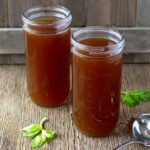 Beef broth or water can be used. Roasted Tomato: Instructions for roasting tomatoes can be found in the recipe card below. However, you can use canned roasted tomatoes also. Beef chuck: Cut into 1-inch pieces or buy stew meat. Masa Harina: This gluten free product is used as a thickening agent. It has a very authentic Mexican corn flavor. Other Ingredients: Onions, garlic, ground cumin, oregano, allspice, apple cider vinegar, chicken or beef bouillon (optional). DID YOU KNOW? Ancho Chiles are whole Poblano Peppers that have been dried. They are also referred as Pasilla Chiles. They are mild in flavor and have very little heat (if any). Authentic Mexican Chile Colorado is all about the red chili sauce. The depths of flavors cannot compare to anything you buy in a can. 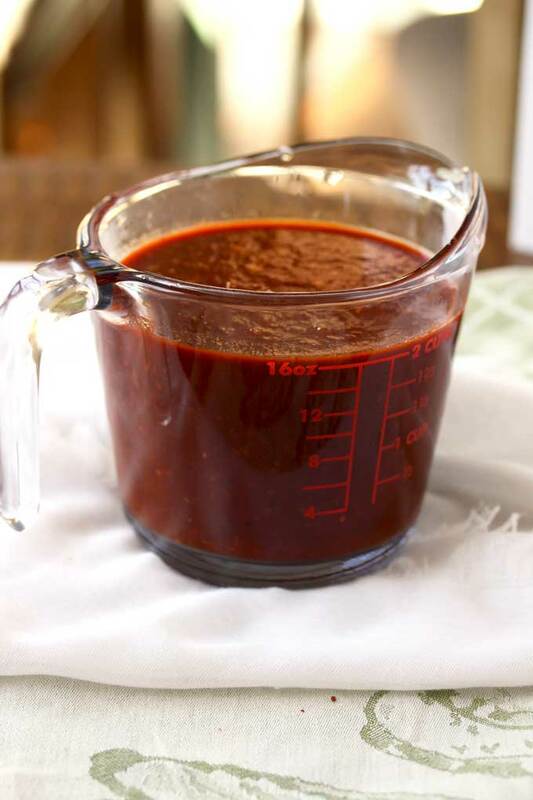 If you’ve never made red chile sauce from scratch, don’t worry! The process is simple and I have a few shortcuts to make things easier! 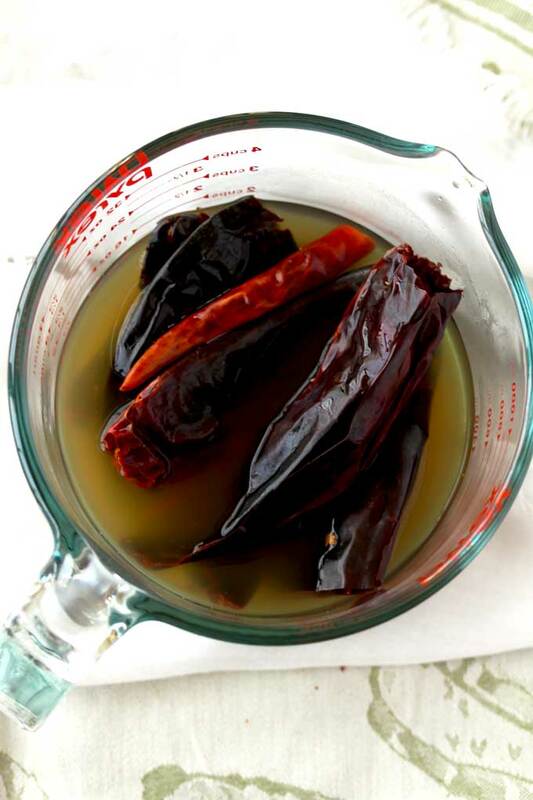 Making this Mexican sauce is as easy as soaking and blending chiles! Use gloves if you have very sensitive skin. Grab a dry chile and remove the stem by pulling it. Open up the chile (use kitchen shears, if needed) and scrape off the seeds and any ribs. 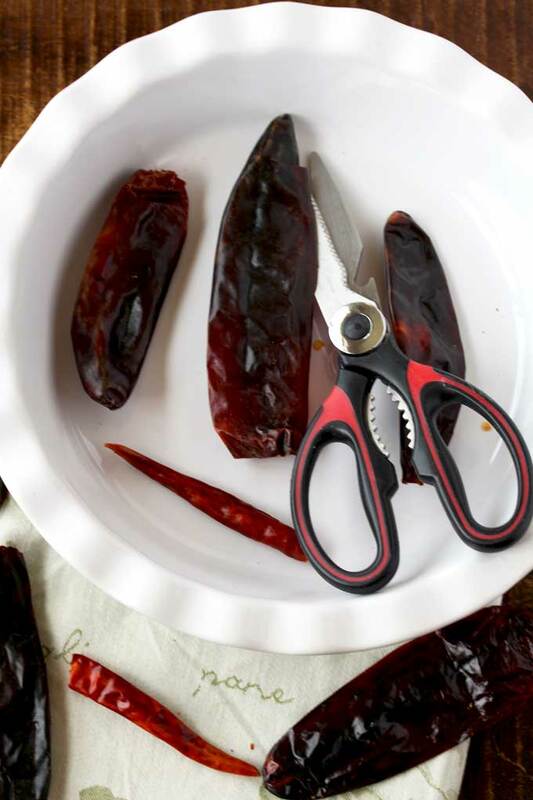 If the chile is small (like chile de arbol), after pulling the stem, turn the opening down and squeeze the seeds out by gently massaging the chile. Toast the chiles in the microwave – yes! you heard me right! I learned this method from serious eats. Place the chiles on a microwave-safe plate and microwave on high for 30 seconds total (do it in two 15 second intervals). They should be toasty and pliable. Microwave water (or broth) until warm. Submerge the chiles into the liquid, cover and microwave again for about 2 minutes. Add the chiles and liquid into the blender and process until smooth. If you do not like using the microwave, you can toast the chiles on a dry cast iron skillet over medium heat, turning the chiles as needed. Also you can boil water (or broth) and soak the chiles in the liquid for 30 minutes. At this point, you are ready for blending! Brown the beef over medium high heat. Remove from the pot and set aside. Saute the onions, garlic and add the spices. Return the beef and any collected juices to the pot. Add the red chile sauce, remaining broth and simmer until the beef is tender. Make a Masa harina slurry by using some of the cooking liquid (beef juices) and mixing it with the masa harina. Pour the masa harina slurry and the apple cider vinegar into the chile colorado beef stew and simmer for 5 minutes. 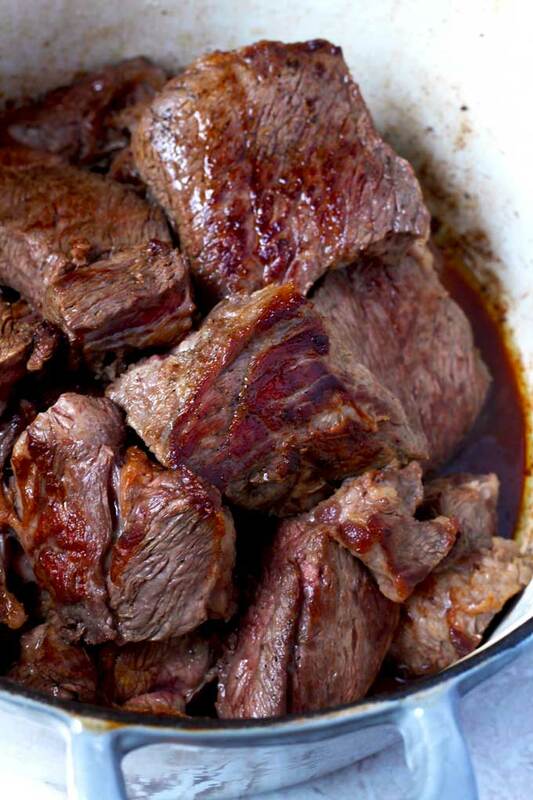 You may need to brown the beef in batches to prevent over crowding the pot. You want to get a nice sear on the beef instead of steaming the meat. If making this beef stew recipe in the slow cooker, you should brown the beef first. I am not a big fan of canned beef broth. I don’t think it has any beefy flavor. I use canned chicken broth instead. When blending hot liquids, make sure you hold the blender’s lid down with a kitchen towel to prevent a big messy blow out! Also, always start blending in the lowest setting. Do you love beef stew? Check out my recipe for Spicy Chipotle Shredded Beef Barbacoa (my copycat version of Chipotle) and this classic and delicious Beef Stew in Red Wine. I love making all beef stew recipes in an Enamel Cast Iron Dutch oven. Although I love Le Creuset brand, this budget friendly Dutch Oven is excellent and one I use often. WANT TO TRY THIS CHILE COLORADO BEEF STEW? PIN IT TO YOUR DINNER OR MAIN DISH BOARD!! Chile Colorado - this rich and hearty stew recipe is lip-smacking good! Beef stew meat simmered in a Mexican style red chile sauce until fall-apart tender. Place the chiles on a microwave-safe plate and microwave on high for 30 seconds total - in 2 intervals of 15 seconds each. Heat 2 cups of chicken broth until warm - you can do this in the microwave. Submerge the chiles into the broth, cover and microwave for about 2 minutes. Place the chiles, the roasted tomato and the liquid into a blender and process until smooth. About 2 minutes. Set aside. When blending hot liquids, you must hold the blender lid down with a kitchen towel to prevent the lid from popping up violently. Season the beef with salt and ground black pepper to taste. In a large pot or Dutch oven, heat the oil over medium-high heat. Add the beef to the pot in a single layer and sear on all sides until the beef turns golden brown. You may need to do this in batches to prevent over crowding the pot. Remove the seared beef to a plate and set aside. When you are done searing all the beef, add the onions to the pot (add more oil if needed), and saute for about 3 to 4 minutes or until the onions become soft and translucent. Add the garlic and cook for 1 additional minute. Add the spices and cook for 1 minute stirring constantly. Return the beef and any collected juices back to the pot. Add the red chile sauce and the remaining broth and stir to combine. Bring to a boil. (If cooking in the oven or in the slow cooker, you can follow the instructions below). Once boiling, reduce the heat to low, cover the pot and cook stirring occasionally for about 1.5 hours or until the beef is tender. Preheat the oven to 320 degrees Fahrenheit. Place the covered pot in the oven and cook for 1.5 hours or until the beef is tender. Place the seared beef, saute onions, garlic and spices into the slow cooker. Add the chile paste and broth. Cook on low for 7 to 8 hours or on high for 4 to 5 hours or until the beef is tender. Make a Masa Harina Slurry: In a small bowl, mix the masa harina with 1/4 cup of the cooking liquid (beef juices) until the mixture is smooth. You can also use broth or water, if preferred. Stir the masa harina slurry mixture and the vinegar into the beef stew and simmer on the stove top for 5 minutes. (If using a slow cooker, set the crockpot to high and simmer for 10 - 15 minutes). 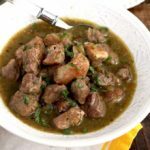 You can use stew meat. You can use a 15-ounces can of roasted tomatoes instead. How To Roast a Tomato: Heat a small cast iron skillet over high heat. Add the tomato and cook, turning often until lightly charred. You can also charred the tomato in the oven under the broil, turning it often. Nutrition facts are an estimate and vary depending on brand of ingredients used. I too am originally from So. Cal. I have been searching for a recipe with the right combination of chiles and spices that fit my tastes. THIS IS IT!!! I will have to search no further. This recipe is DELICIOUSS!!!! Thank you. I’m also searching for a recipe that is my taste for red enchilada sauce. Do you have one?? Is this recipe really spicy and hot or mild? The tomato goes in with the chilies to make the chile sauce. For our family is a confort food, easy to make and its rich flavors and color are just amazing! Thank you Kathy for all the tips and for such a great recipe. Help, I saw the instructions for how to roast the tomato, but I can’t find anywhere in the instructions that say when/ how to add the roasted tomato. I’m excited about making this, thanks! Hi! The roasted tomato goes in the blender with the soaked chiles. Want to try this with las palmas chile colorado sauce but use the spiceafor them meat. What do you put the pressure cooker on? How long? I haven’t try it with store bought sauce.